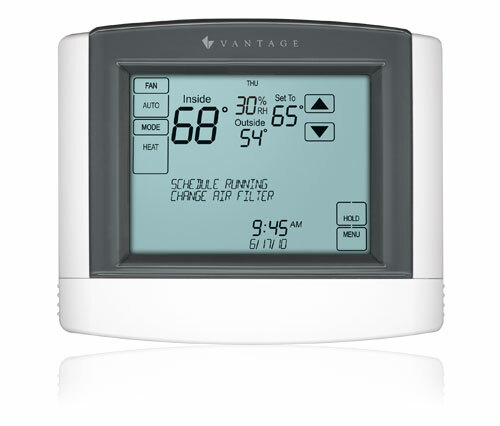 The new model CC-STAT Vantage Communicating Thermostat provides the comfort and energy efficiency that your customers expect with easy installation and full InFusion integration. The CC-STAT may function as a stand-alone HVAC thermostat; however, the system user will experience enhanced and simplified control when the CC-STAT is integrated with the InFusion system. Equinox LCD interfaces and touchscreens provide the interface and the CC-STAT, installed near the HVAC system, provides the control. When combined with the thermostat Interface Station, this multi-function thermostat is compatible with most residential HVAC systems, including single stage, heat pump, multi-stage and control of humidifier and dehumidifier systems. An additional benefit to the Vantage communicatingthermostat is that it can directly receive signals fromboth internal and external sensors, eliminating the needfor additional hardware to interpret the signal. Internaland external temperature readings are easily visibleon the thermostat display or transmitted to Vantagetouchscreens giving the homeowner integrated andinstant access and control of their home's environmentaland comfort systems. One thermostat for all applications - works with single-stage, heat pump, multi-stage and control of humidifier and dehumidifier systems.